verse:- IN THE CROSS IS SALVATION, IN THE CROSS IS LIFE... 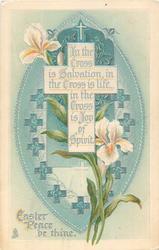 IN THE CROSS IS JOY OF SPIRIT. from thomas a kempis "The imitation of Christ"